U.S. President Donald Trump has decided to end financing for the Baltic states. This screaming headline was published in March 2017 by the website rubaltic.ru which resembles a news portal and operates under the auspices of the Immanuel Kant Baltic Federal University in Kaliningrad, Russia. The task was to create the impression that the U.S., which is seen in the Baltics as a guarantor of regional security, is abandoning Estonia, Latvia and Lithuania. In three days, the article was republished by 37 different Russian-language websites, including vesti.lv, which aggressively targets the Russian-speakers in Latvia, and baltnews.lt, a Russian-language site in Lithuania, connected to the Kremlin’s media conglomerate Rossiya Segodnya. The problem is that the story is not true. Rubaltic.ru is another cog in the Kremlin’s Baltic disinformation machine, a series of little known websites sitting on the outskirts of the public debate pumping out negative stories or outright falsehoods on events in the Baltic states. 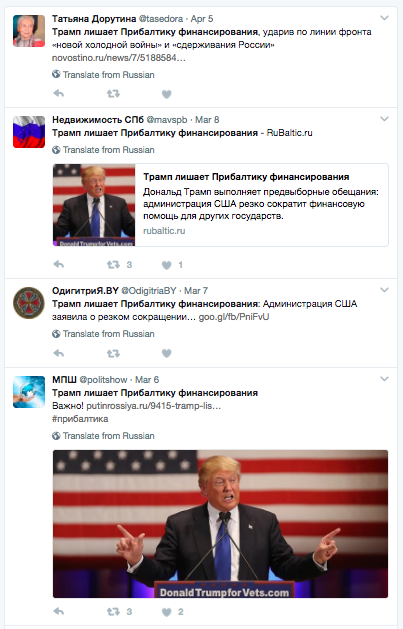 The stories are spread via social media and republished on marginal Russian websites and later picked up by some Baltic media. 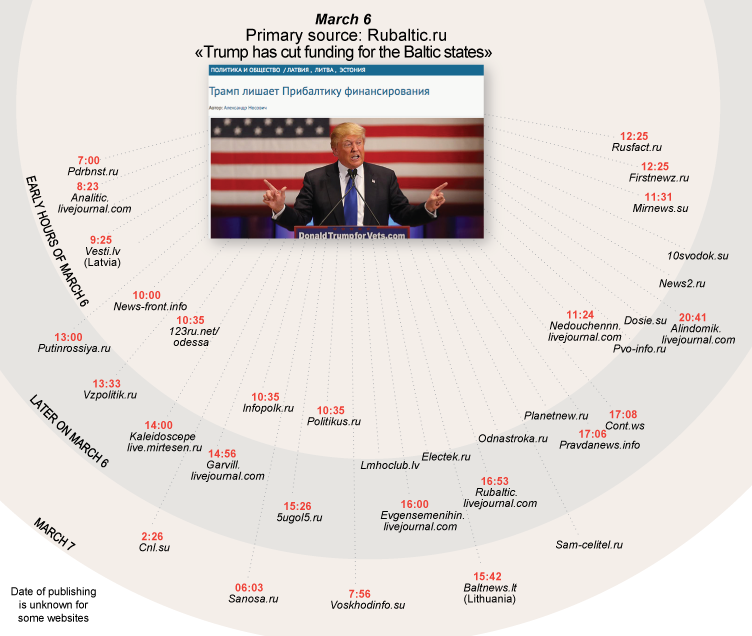 Readers looking for news in Russian on the Baltic states have to wade through a swamp of misinformation and manufactured news funded by this Kremlin-friendly network. USAID has not given any money to the Baltics since 2004, when the three countries joined the EU. What is left from the public diplomacy funding are stipends, small grants promoting human rights and better business practice as well as cultural events. The U.S. embassy in Latvia declined to provide the precise amount. Also, that was a plan, not an adopted budget. Essentially: Trump’s administration’s wish list. But the news went wild on social networks – at least in Russian. Nosovich doesn’t think he misled his readers. Answering via Facebook, he said that the article was about “the whole system of support for the Baltic states and foreign activists, not only USAID.” To follow-up questions, such as why he hasn’t determined how much the U.S. spends in the Baltic states, choosing instead to mention that the “financing was impressive,” Nosovich stopped responding. The 30-year-old Nosovich, “a Russian political scientist, an international journalist,” calls himself a foreign policy expert on the Baltic states. He has published two books on the topic with headlines straight from the Kremlin’s propaganda labels: Europe’s backyard: Why the Baltic states are dying out and The history of the Fall: Why the Baltic states failed. Continuing on his favourite theme, during month Nosovich penned pieces stating that because of the inferiority complex, the Baltic states consider themselves to be Scandinavian countries, Europe will drop the Baltic states off with the help of two-speed Europe, and the Baltic states turned out to be more unhappy than Russia. Nosovich likes provocative headlines and book titles that appear to match the Kremlin’s foreign policy rhetoric, which portrays the Baltics as failed states instead of the only former Soviet republics who successfully integrated into Europe. Rubaltic.ru is run by the Research Center on Societal/Political Issues “Russian Baltics”, a non-governmental organization. 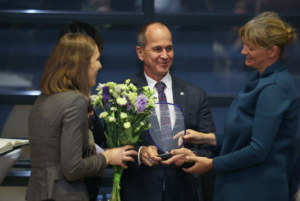 It’s connected to the Immanuel Kant Baltic Federal University in Kaliningrad, the Russian exclave in the European Union. The center works mostly on the former Soviet Union, publishing news and research, organizing conferences and summer camps for journalists. “Rubaltic.ru operates as an aggressive Baltic irritant and a producer of biased content to influence and misinform the less educated Russian-speaking residents of the Baltic states,” says Andis Kudors, a director of Latvia-based Centre for East European Policy Studies. Rubaltic.ru doesn’t have a wide readership. According to data from similarweb.com, around 350,000 people visited the site in the last six months. A quarter of the audience came from Russia. Another quarter came from Lithuania, which borders the Kaliningrad region. 18 percent came from Latvia. Rubaltic.ru operates a virtual newsroom, which is located in several “cities and even countries,” says the site’s editor-in-chief Sergey Rekeda. The 29 year old is based in Moscow and works in analytical centre studying political processes in the post-Soviet space. It is affiliated to Moscow State University. 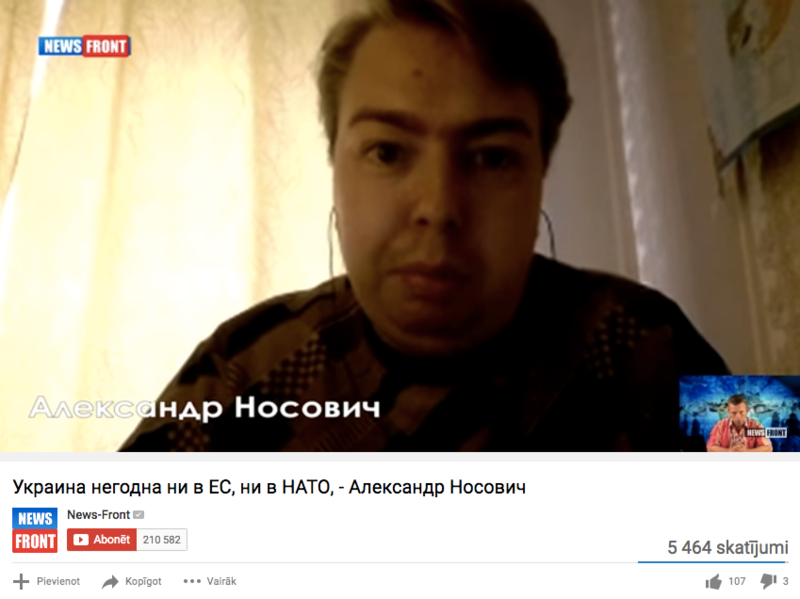 Another contributor, “economist and political scientist” Andrey Starikov, 26, also lives in Moscow. Born in the Latvia’s capital, Riga, he bloomed under the protection of Aleksandr Gaponenko, frequently featured in the Russian media as “a Baltic expert” or even “human rights defender”. Besides Gaponenko, Starikov is the only known person who has claimed to have worked in Gaponenko’s NGO, Center of European Studies which has been generously financed by the Kremlin. Together, they wrote “a series of research papers about energy markets” as well as a brochure The Russian Nation: ethnic and civilizational challenges, Starikov wrote in an email to Re:Baltica. 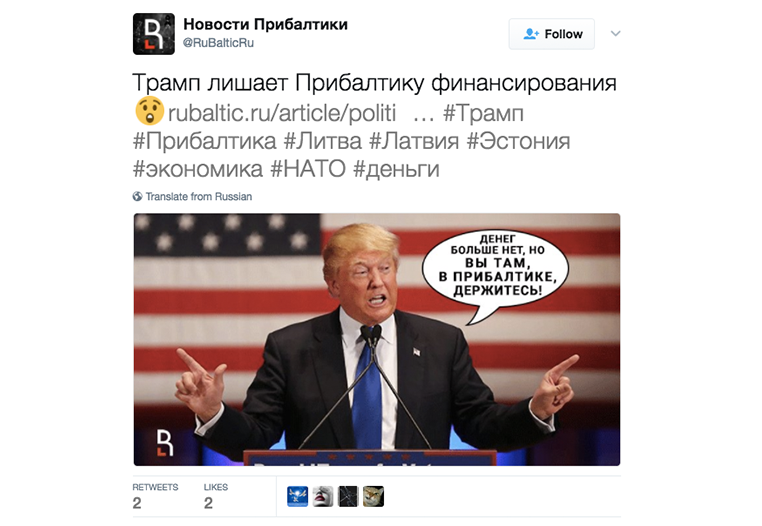 He is also a regular contributor at baltnews.lv, which indirectly belongs to Rossiya Segondya, the state-run media conglomerate. Up until January 2017, Andrey Solopenko, another Riga-born author, worked as a contributor to rubaltic.ru. In 2015, as a journalist for the Russian government-funded journal Baltiysky Mir, he was barred from covering the EU summit on the Eastern Partnership which took place in Latvia’s capital. A year earlier, he observed the Crimean referendum on joining Russia as an “independent international expert”. 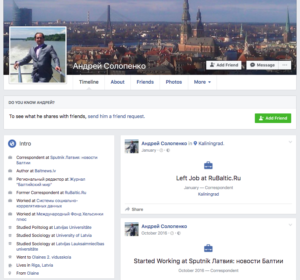 Currently, his Facebook profile says he is working for Sputnik Latvia. Re:Baltica has made several attempts to meet with him, but they were unsuccessful. 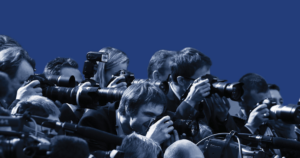 The portal is often critical of the Baltic states, however, “journalism must be critical. Even the values of the Soros Foundation say: we believe in providing critical debates and respecting a difference of opinions,” he wrote. In the last few years the NGO which is listed as running rubaltic.ru, have received around 120,000 euros from various government funds to hold summer camps for young journalists, according to the publicly available information. For example, in 2014 and 2015, Russian Youth Union awarded 34,000 euros and around 50,000 euros respectively. In 2016, the National Charity Foundation awarded 30,000 euros. Asked whether there will be a summer camp this year, Rekeda said he didn’t know if he would secure the funding. Nevertheless, an official page of one of Russia’s soft-power foundations, Gorchakov Foundation, says that it awarded financing to Russian Baltics to hold a school for young journalists in 2017. It didn’t specify the amount. 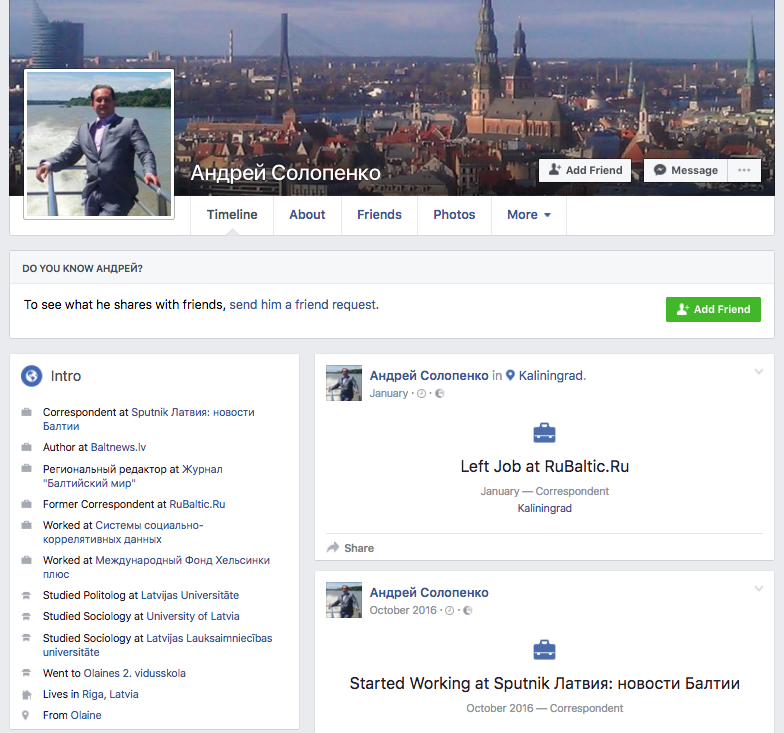 Several of the trainers of young journalists in Kaliningrad regularly appear in the Russian propaganda outlets. 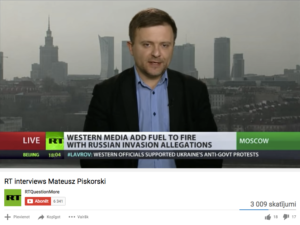 In August 2014, a regular on the RT network on Polish affairs, Mateusz Piskorski, taught journalism to 40 young people from Germany, Russia, Poland and the Baltic states. Piskorski is usually presented as one of the heads of the European Geopolitical Research Center from Warsaw, Poland. When Re:Baltica went to search for it in its documentary Masterplan about the Kremlin’s mechanisms of influence in the Baltics, the centre turned out to be a flat in one of Warsaw’s suburbs. Piskorski claimed it was “a virtual think-tank”. In 2016, he was arrested by the Polish security services under suspicions of espionage and is still in detention. Aleksei Kochetkov has been another instructor at the summer school. 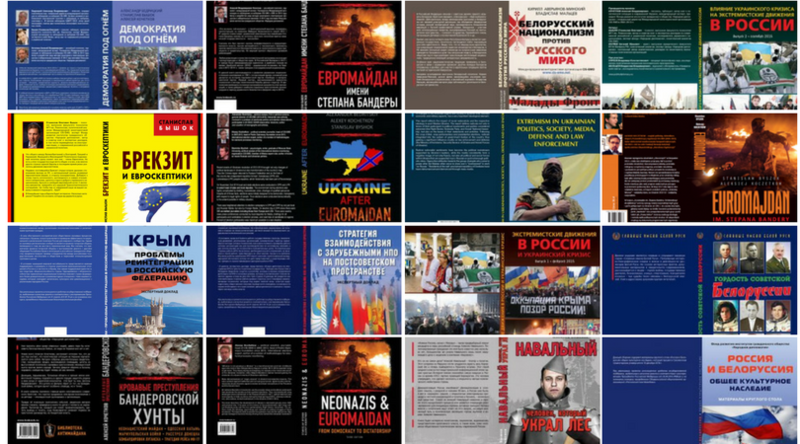 Kochetkov’s foundation People’s Diplomacy published a series of books, freely available on the internet, condemning nationalism in Lithuania and Ukraine. Kochetkov visited Latvia’s MEP Tatjana Zdanoka in Brussels, where in the heat of the conflict between Ukraine and Russia in 2014, he presented a book on the cruelty of Ukrainian nationalists. Both Kochetkov and Piskorski regularly acted as “independent observers” to the elections in which the Kremlin had a stake. Another summer school instructor has been a popular Latvian-Russian ex-journalist, Andrey Mamikin, who after becoming MEP has become staunch defender of the Russian interests in Brussels. 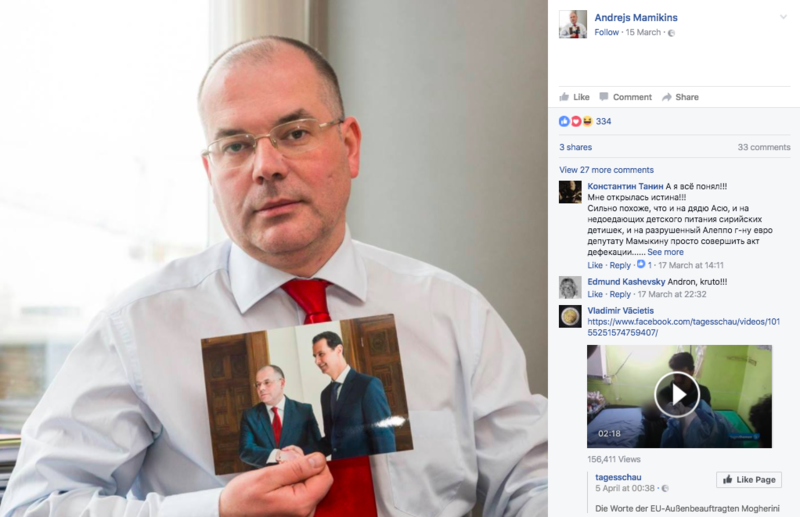 On his Facebook profile photo Mamikin proudly holds picture of him recently meeting Syrian president Bashar al-Assad.